The exhibition Stories of the Biological Collections of the CAS is held from 14th November 2017 till 11th February 2018 in the Průhonice Castle. 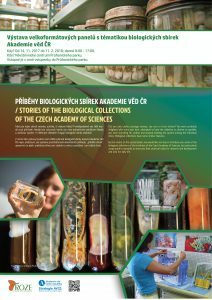 It presents some of the biological collections of the institutes of the Czech Academy of Sciences and shows, using specific examples, their practical value for research and development and also in daily life. Open daily 8:00 a.m. – 5 p.m.